Carodus Oholin is an Imperial crusader added by the Knights of the Nine official plug-in. He is located at first at the Chapel of Zenithar in Leyawiin, where he is involved in the quest The Path of the Righteous. After the quest is completed, he requests to become a Knight of the Nine and then appears at the Priory of the Nine. Once he is a knight his name becomes Sir Carodus. During Carodus's pre-knight days he wears a mixture of iron and legion armor, specifically an iron cuirass and iron greaves. His legion armor consists of legion boots, legion gauntlets, and a legion shield. He wields a steel longsword in combat. After he is knighted he will wear chainmail boots, gauntlets, greaves, and helmet, with a Knight of the Nine Cuirass and a Knights of the Nine Shield. He carries leveled restore health potions. Carodus also knows a leveled set of crusader spells, as well as one extra minor restore health spell. Speaking to Carodus Oholin when you encounter him at the Chapel of Zenithar, before the attack by the Aurorans, will have him greet you by saying; "It's you! I've heard of you! You're the one restoring the Knights of the Nine, aren't you?" If you admit that he has correctly identified you he will respond by saying; "My name is Carodus Oholin. Like you, I am a servant of the Nine. Specifically, of Zenithar. I came here seeking his mace. However, I could not pass the test. I'm just... I'm no crusader. But that doesn't mean that I cannot serve Zenithar. In light of the recent attacks, I've signed on to protect the chapel. I'm a fair with a blade and by my honor, I'll serve the Nine in any way I can." If you instead claim to be nothing more than a servant to the nine he will be honored by your humbleness: "Such humility -- I admire you. I am Carodus Oholin. I originally came to this chapel in search of the Mace of Zenithar. I tried, but I could not pass the test. My faith was weak. Or perhaps Zenithar decided that it was not I who should carry the mace. He has found a use for me, however. The priests have asked me to stay to protect the chapel. After what happened in Anvil, they are afraid." Asking him about himself will have Carodus Oholin give you information on his past; "I grew up in Cheydinhal. My father was a cobbler. My mother was an acolytle [sic] of Zenithar. She was self-taught, not part of the chapel proper. They were... they were both killed in an accident when I was young. I became a ward of the crown and was drafted into the Imperial Army. After serving two tours patrolling Stros M'Kai, I left the service for a life devoted to Zenithar, inspired by my parents." Questioning him about his views on the god Zenithar will have him reply; "Of the original divines, Zenithar is thought to be the most in touch with the mortal realm. Some legends say that Zenithar has close ties to Kynareth, an idea that is supported by the manner in which the two gods' realms interact. Craftsmen devoted to Zenithar are able to create and profit from the materials provided by Kynareth's natural world. The two work in harmony -- the natural world providing for the craftsmen. One cannot revere Zenithar without acknowledging the power of Kynareth." Asking him about the Mace of Zenithar will have him tell you what he knows about the artifact: "Legends say that when Pelinal Whitestrake was slain by the Ayleids, a messenger carried the Mace to the human settlement of Leyawiin as a message. Centuries later, the master craftsman Saint Kaladas built the Chapel of Zenithar in Leyawiin as a tribute to the legend. When Saint Kaladas was laid to rest, those who prayed to Zenithar at his tomb began to receive visions of the Mace of the Crusader." At any point during this conversation claiming that you must go will have him say farewell with the line; "Very well. I wish you luck, Sir Knight." Speaking to him again before retrieving the Mace will have him greet you by either saying; "Have you had any luck retrieving the Mace? " or, "So far things have been quiet. After the horror in Anvil, the priests here are more than a bit nervous." 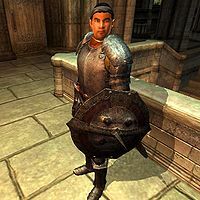 Speaking to Carodus after the attack on the Chapel by the Aurorans, but before you leave the chapel, will have him praise the nine for the victory; he will also request that you allow him to join your order: "I... I can't believe it! We survived! By the grace of the Nine! We survived! In no small part to you, Sir Knight. By your will and the will of the Nine, the chapel of Zenithar has held against this blasphemer! Sir, I pledge you my sword. I wish to join you in your quest to restore the Knights of the Nine and defeat this... Umaril." If you choose to knight him, inducting him into your order, he will be honored by your acceptance: "I can only hope to match your bravery and valor. I am honored to serve by your side. Allow me to fetch more suitable equipment. I shall return shortly." If you decide that he is not yet ready he will sadly honor your decision, he will also make a remark that he hopes you change your mind: "I understand. I can only hope that one day, you will judge me to be worthy." If you do not speak to him while in the chapel he will head over to the Priory of the Nine. Speaking to him there will have him request that you induct him into your order, offering you the same choices that you had in Leyawiin: "After seeing your bravery first hand in Leyawiin, I'd like to join you as one of the Knights of the Nine." If you deny his request at any time, speaking to him again will have him ask if you have changed your mind, once again offering you the same choices on whether to accept him into the order or not: "Sir Knight, I was wondering... have you reconsidered my offer to join the order?" It is possible for Carodus to be stuck permanently following you if you trigger the KotN follower bug; see bugs for details. Carodus joins the Knights of the Nine faction after completing the quest The Path of the Righteous.